Join the Pathfinder RPG design team for an up-close look at the rules of the Pathfinder RPG. Pathfinder game designers take your questions and discuss the philosophy behind the Pathfinder game rules. Warning – These are live and unedited recordings of the GenCon 2015 seminars. If the seminar contains audience participation, it may be difficult to understand some of the audio. Also be warned – these seminars may contain cheeky language. 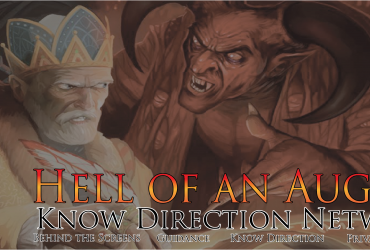 Know Direction’s GenCon 2015 coverage is made possible by the KD Con team. Thanks go out to Monica Marlowe, Chris Hall, and Eric Brandon Ives.